This research project developed diagnostic assays needed for advancing the understanding of blackhead disease. 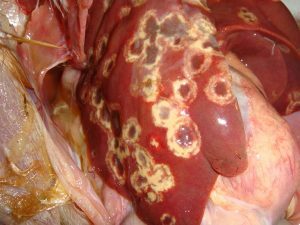 The article shows clearly how the disease most likely spreads and clarifies which cleaning and disinfecting methods are effective in decontaminating facilities and equipment. Heterakis gallinarum (heterakis) is a heavily prevalent but rarely diagnosed avian parasite that poses a silent threat to poultry producers. The eggs of this nematode often act as carriers of a protozoan parasite called Histomonas meleagridis (histomonas) which causes a potentially deadly disease in poultry commonly referred to as blackhead disease. The prevalence of blackhead disease has increased significantly over the past three decades due to the revocation of FDA approval for use of drugs in commercial poultry that were previously administered to prevent transmission of the protozoan and treat afflicted birds. Poultry producers must adapt their farm management practices to mitigate the chances of transmitting the protozoan between flocks. This may be accomplished by controlling the spread of heterakis. However, preventing flock to flock transmission of heterakis on commercial poultry facilities is made difficult by a limited understanding of reservoirs for infection and a lack of information regarding effective decontamination procedures. develop an assay to test the efficacy of different compounds to destroy heterakis. A highly sensitive and heterakis-specific PCR test was developed and validated. This diagnostic PCR was used to demonstrate that both earthworms and darkling beetles may act as potential carriers or vectors of the nematode. Detection of heterakis was seen in earthworms collected from backyard chicken flocks and turkey grow-out facilities that were experiencing outbreaks of blackhead disease. These data suggest that testing a known carrier of this nematode can indicate whether heterakis is present on the facility. The detection of heterakis DNA from darkling beetle isolates indicates that beetles may be responsible for the transmission of blackhead disease between flocks. 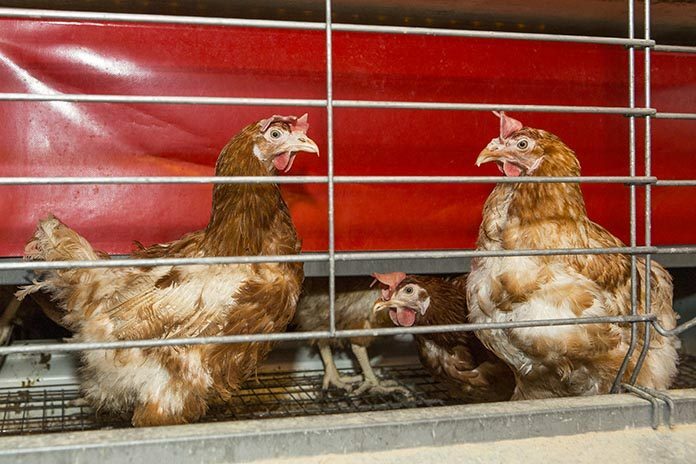 One hundred percent of mature broiler breeders and floor raised layers sampled during this study were positive for sexually mature heterakis in their ceca. Based on PCR analysis, all populations of heterakis collected were positive for histomonas. Each of these birds are therefore responsible for shedding heterakis eggs into the environment resulting in recontamination of the chicken facility and serve as a source of contamination for other poultry facilities, especially when litter is removed from the facility and spread at other locations. An assay was developed to test whether chemical treatment or disinfectants are capable of damaging heterakis eggs and rendering them nonviable. Six chemical compounds (i.e. ; sodium hypochlorite in Clorox Bleach; sodium dichloroisocyanurate; a combination of hydrogen peroxide, N-Alkyl-N,N-dimethyl-N-benzylammonium chloride, and diacetin; a combination of propionic acid, acetic acid, ammonium hydroxide, sodium hydroxide, and iodine; sodium bisulfate; and a combination of potassium peroxymonosulfate and sodium chloride) in addition to salt, limestone and diesel fuel were tested. Both sodium hypochlorite and sodium dichloroisocyanurate damaged the eggshell, but only 15,125 parts per million of sodium hypochlorite was capable of rendering the egg nonviable. These results demonstrate that the majority of current cleaning protocols are not effective in killing heterakis eggs in poultry houses and indicate the urgent need for product testing to identify farm management protocols to decontaminate farm equipment or poultry houses.